My last job before I retired from IBM was leading the mobile strategy for mainframe computers. In this job I was able to read many research studies that predicted the increasing importance of mobile and how it would affect our large customers. But you and I really don't need corporate research to tell us that mobile is a trend. Just look around. Almost everyone in the Hudson Valley has a mobile phone, and not only a mobile phone, but a smart phone -- a phone that can run a web browser and apps. Look at the popularity of tablet computers like the iPad, and the popularity of mobile apps. We don't need much research to tell us that these devices are popular, and people are using them to do more than make phone calls, send texts, and play Candycrush! They are using them to reach your website. If you're my age you may not be noticing this trend. We grew up using desktop or laptop computers to access websites, and we're still used to doing it that way. But for people under 30, they grew up with smart phones and apps. Many of them do not own a laptop or desktop computer. Many of them do not own a landline phone. Many of them do not have home internet service. Many only have their smart phone and a data plan from their mobile carrier. 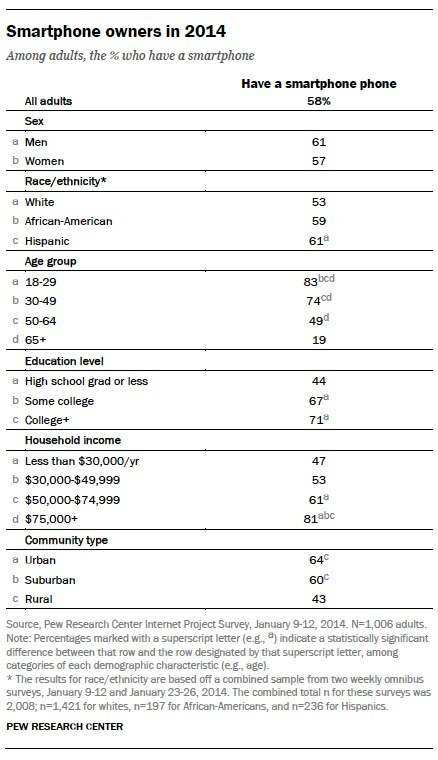 In other words, many people under 30 today predominantly access the internet via their smart phone. 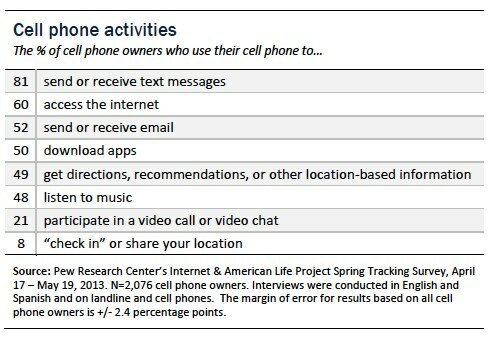 Charts from Pew Research Center article "Mobile Technology Fact Sheet". And note that this research is over a year old. 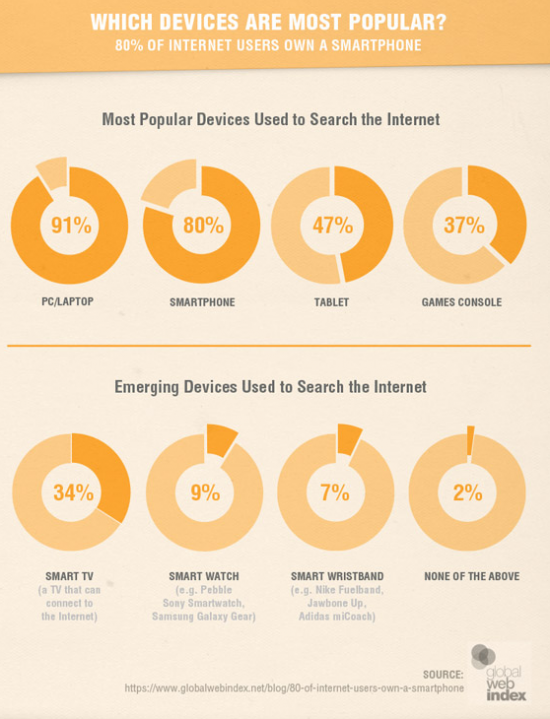 Here is another chart that is a good summary of the types of devices people are using to access the internet. Wow, not only are people using smart phones and tablets to access web sites, but they are also using internet-connected TVs, game consoles (like X-box and Playstation), and e-readers (like Kindle and Nook). Now we have to worry about those devices too! Lets Look at Internet traffic to see the affect on popular websites. Traffic to the leading U.S. search engine (Google) shows that a substantial proportion of their traffic comes from mobile devices. For Google, mobile comprised almost half of all traffic from June to November 2014, with 52 percent coming from desktops and 48 percent from mobile. However, in November, mobile traffic surpassed the quantity of visits from desktop. Online shopping is also a good indicator of the trend of traffic shifting to mobile, with Amazon.com a case in point. Amazon's visits from mobile and desktop are almost equal, with desktop responsible for 51 percent of all visits. How about news sites? They currently receive, on average, 35 to 40 percent of their traffic from mobile devices. The New York Times website is a good example of this, receiving 38% of it's traffic from mobile devices. 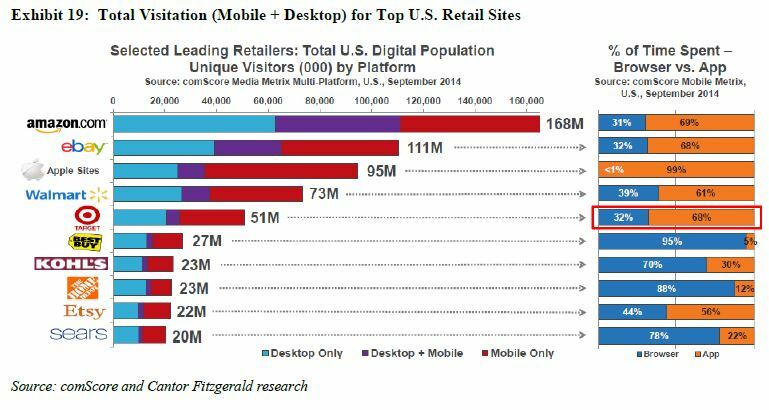 Charts from Search Engine Watch article "Why Mobile Still Matters in 2015"
Here's another interesting chart that shows mobile access to popular internet retail sites. If you're actually reading all this stuff you may notice that this chart shows slightly higher mobile access for Amazon than the other chart above. This is because they are including accesses from Amazon's mobile app, and not just accesses to the Amazon.com website from mobile devices. It means we need to pay attention to mobile devices when building websites, since many of the potential visitors to our Hudson Valley websites may be viewing them on a mobile device. In the next part of this series, we'll start exploring how your website appears on a mobile device, and various techniques we have as website developers to improve the mobile user experience. Continue Reading Part 2 -- What is a Mobile Website?